Are you overwhelmed by electronic media and computer work? Allow me to support you with your technical work. I can help you understand the technical jargon and simplify your life by providing technical services that do not interest you so you can spend your time doing what you enjoy. My goal is to EMPOWER you as business owner by helping you understand the technical details. I can create a custom WordPress website, and teach you how to administer the website, if you so choose. I can administer your WordPress website. I can create a newsletter template and guide you through the process of sending out your newsletters. I can coach you through your fears and help you feel empowered. Knowledge is powerful. I can provide many more technical services as well. I am an experienced civil engineer and health coach with excellent technical and communication skills. Allow me to share my expertise with you. 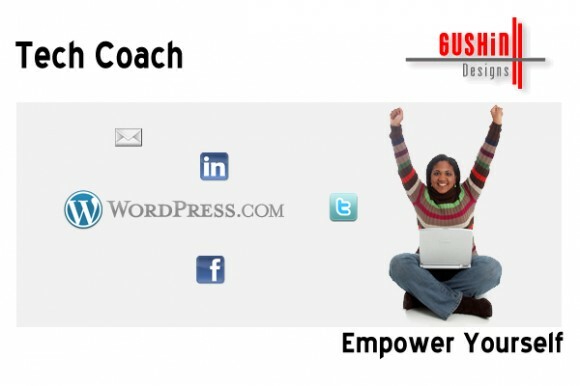 I am a partner in GushinDesigns, so when you hire ME as your Tech Coach, you also get the support, experience and guidance of a Master Web Specialist, Dennis Guten, every step of the way. All technical coaching and website creation is provided for a fee of $32/hour. Travel charges do apply. I can give you the technical assistance you need to publish your work on a blog. I can provide the technical assistance you need to establish your online presence on a variety of social media sites, including Facebook, Twitter, and Instagram. I can provide additional technical services and coaching as needed.